I'm on the record as being a big 4K fan. It's about time PC made the leap to high-density displays, what with 1080p becoming routine in smartphones and super-res tablets like the Nexus 10 getting cheaper all the time. So, the only problem I had the first 4K PC monitor I tried was the price. At £3,000, the Asus PQ321Q was simply stupid money. Then a few other outfits announced 4K models, including Dell as it happens. And all of them lined up at similar pricing. But honestly, what's the point of a £3,000 PC monitor? Hardly anyone is going to buy one. 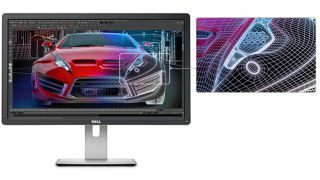 Enter a pair of new panels from Dell. The first is a the the UP2414Q, a 24-inch 4K model priced at $1,399 (call it roughly £1,000 in the UK). It's part of Dell's high-end UltraSharp line and sports IPS panel technology. So, that's 3,840 by 2,160 on a 24-inch panel. Can you imagine the sheer, giddy pixel density? At normal viewing distances, we're probably approaching 'retina' display territory where picking out individual pixels becomes tricky. It sounds glorious. At the same time, I'm also worried about Windows DPI scaling, font sizes and broader usability with such a high DPI display. Even with the 8.1 revision, Windows doesn't scale well outside the touch interface. But wait, there's another option, the Dell P2815Q. Fewer details have emerged for this model. All we really know is that it's 4K, 28 inches and - get this - will retail below $1,000. Now we're talking. OK, it'll probably still sell for £700 or more in the UK. But that's much more reasonable, especially when you consider that a monitor is just about the only PC component that stands up as a long term investment. I have six-year-old 30-inch panels that have stood the test of time and only with the arrival of this new 4K army are beginning to feel dated. But hang on, there must be a catch. After all, how can a 28-inch 4K monitor be cheaper than a 24-inch sibling? There's a clue if you click on this link www.tftcentral.co.uk/articles/monitor_panel_parts.htm . That's the best info I know of and the only 28-inch 4K panel is a new TN model from Chi Mei Optoelectronics, hardly a household but actually the world's fourth biggest makers of the panels that go into PC monitors. Anyway, given the price of the P2815Q, I've an inkling Dell has indeed gone for the TN option. TN and 4K isn't an obvious combination to make, but TN is getting better all the time and it certainly sounds like it has potential for one hell of a gaming screen.